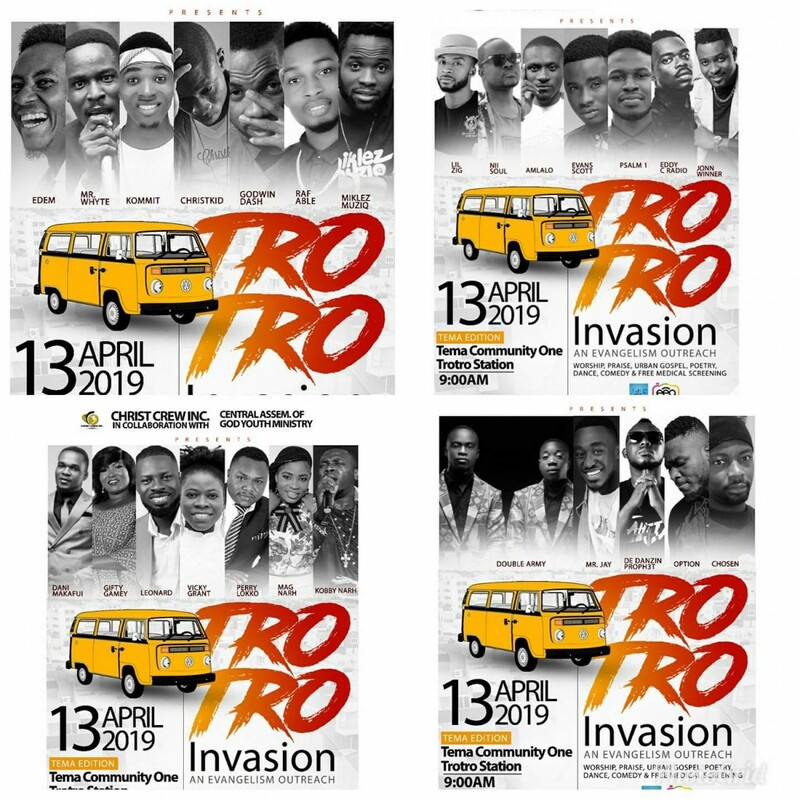 Christ Crew presents TROTRO INVASION 2019. TROTRO INVASION is strictly an evangelism and outreach event held annually. The first two editions were staged in Ashaiman and this year's event comes off on Saturday 13th April at the Tema Community One trotro station at 9am prompt. There will be a special health screening on the premises, praise, worship, urban gospel, dance, poetry and comedy from so many top gospel and urban gospel artists. Artists on bill are: Psalm 1, Lil Zig, John Winner, De Danzin Proph3t Perry Lokko, Nii Soul, Call Me Nazareth, Fifi Ababio, Amlalo, Mag Narh, Kobby Narh, MrWhyte, Edem Da Evangelist, Chosen Listowel, Gifty Gamey, Leonard, Dani Makafui, Eddy C. Radio, Vicky Grant, Evans Scott, MrJay, Raf Able, Double Army, Option, Kommit, DJ Paloma and many others. TROTRO INVASION...... Rescuing the Perishing!!! TROTRO Invasion is powered by: The Christ Crew Inc. (Central A/G-Ashaiman).